Circa, the invention of and collaboration between Billy Sherwood and original Yes keyboard player Tony Kaye, continues with the release of their fifth album, Valley Of The Windmill. They're joined by two new additions, Ricky Tierney on bass and Scott Connor on drums. If you have some knowledge and experience with Circa you pretty much know where things are going. 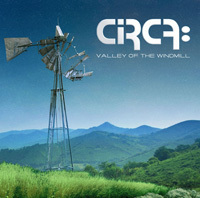 Circa and Valley Of The Windmill is prog. With more elaboration, this is melodic progressive rock in the classic tradition, leaning toward a more synthesizer forward sound. Additionally, the Circa sound moves towards the more lighter, gentler, side of prog. There's nothing particularly "heavy" about this album. The music is softer, airy, even ethereal at times, and lilting along. Alternatively, Our Place Under The Sun moves with a deeper groove, but nothing towards progressive metal. It's also the one song where Billy Sherwood's guitar lines seem more prominent. Generally, with most prog albums there's something for every listener, and perhaps this is true for Valley Of The Windmill. 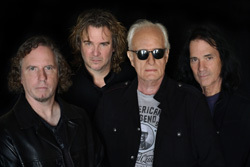 But mostly the album reminded me of a warmed over mixture of Yes, Genesis, and Marillion. Additionally, for all the talent and creativity, I didn't find anything here to be all that memorable. Nothing really hooked me and kept me interested. (Perhaps the reason for this is that it seemed too keyboard present for me.) Valley Of The Windmill is an album that could be played in the background at a wine and cheese party and nobody would notice it. Not because it's boring, but because it's benign and circumspect. Nevertheless, while I came down on the side of ambivalence, Circa fans will likely find Valley Of The Windmill another pleasing addition to their catalog. While I came down on the side of ambivalence, Circa fans will likely find Valley Of The Windmill another pleasing addition to their catalog.